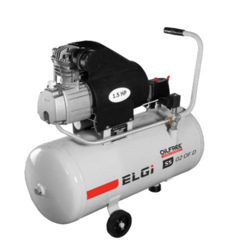 Leading Manufacturer of elgi oil free air cooled compressor, 10-15 hp oil free air cooled compressor, single stage direct drive oil free piston compressors, two stage oil free piston compressors and oil free air cooled compressor from Coimbatore. 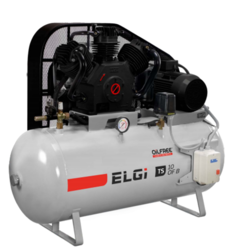 Leveraging over the skills of our qualified team of professionals, our company offers ELGI Oil Free Air Cooled Compressor. Our product range is built with a dry sump design and unique suction through crankcase design. These Oil Free Air Cooled Compressors are used in different medical complexes and food processing industries. With our rich industry experience and knowledge, we are engaged in offering high quality 10-15 HP Oil Free Air Cooled Compressor. These Air Compressors are extensively demanded among the customers due to its supreme quality and these are extensively used in suitable industrial applications. Our products are available in various specifications. Unique Suction Through crank Case Design. 4 HP models are twin systems ( 2x2HP Versions) With and in-built delay timer to swithc on the second unit after a few seconds from the start of the first unit. Internally coated air receiver for corrosion resistance. The two stage oil-free reciprocating compressors are Elgr's solutions to the increasing need by industries and research institutions for higher purity in compressed air applications. No oil in compressor is equal to no oil in output air from the compressor" Elgi oil-free compressors are engineered on this principle. Elgi has adapted a dry crankcase that is totally devoid of oil. The internal moving and friction parts of the compressor have been designed suitably to overcome the absence of lubricating oil Sealed bearings have been used for crankshaft and connoting rods. Poly Tetra Fluoro Ethylene (PTFE) coated pistons and PTFE rings have been used to providewear resistance. Designed for industrial duty, the compressor is a perfect solution for applications where oil carried in air can affect the end product or downstream components through which air flows after the compressor. To the customer this means less expenditure on maintenance —elimination of expensive oil removal filters, frequent stoppages for oil top and oil flls in the crankcase. 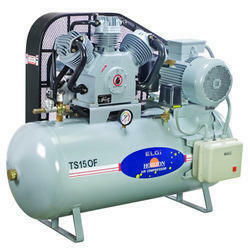 We hold expertise in offering high quality range of Oil Free Air Cooled Compressor. The compact and air cooled design of this range of non-lubricated compressors fulfils the requirements of industries that need round-the-clock oil-free air.